To access settings bring up the Main Menu and move over to the Profile icon and press "OK". Then move the cursor up to the upper right gear icon and click "OK". 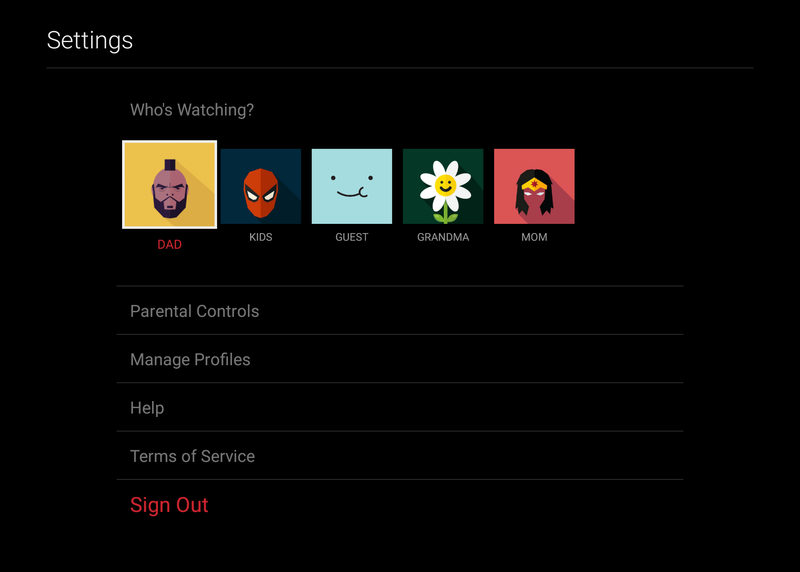 Parental Controls - Enable parental controls here to restrict mature content behind a password. Profiles - Add/remove/edit the profiles on your account. Help - This gives you a quick overview of support information including build version, contact information, etc. If you're talking to Technical Support they may have you reference this information. Terms of Service - The full Terms of Service for using EZVideo. Sign Out - Select "Sign Out" to be signed completely out of the app for whatever device you are currently on. You shouldn't ever have to do this unless you are troubleshooting an issue at the request of EZVideo support.